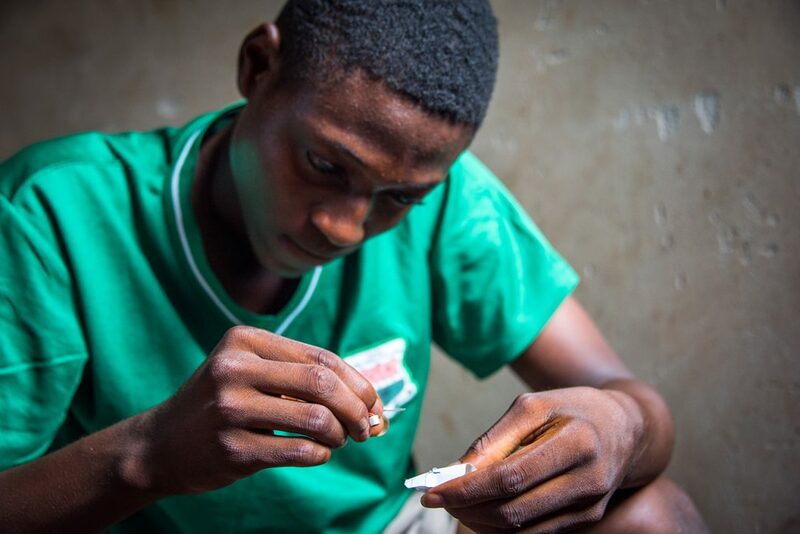 It’s 3 a.m. Richard Amenu, 17, quietly gets up from the cramped room where his family of six is sleeping and makes his way outside to start a fire. He’s run out of matches again so, squatting on the ground, he strikes one small rock against another, trying over and over to create a spark. The click, click, click of the rocks is the only sound in the dark of the night. The pile of sticks beneath his hands are doused in lighter fluid, so it will only take one spark to ignite. As he strikes stone against stone, he considers how this action isn’t so different from how an automobile works—the same spark that starts his cooking fire is what fuels a car’s pistons to move up and down, which sets the wheels turning. Thoughts of machines often swirl through Richard’s head as he goes through his morning routine. 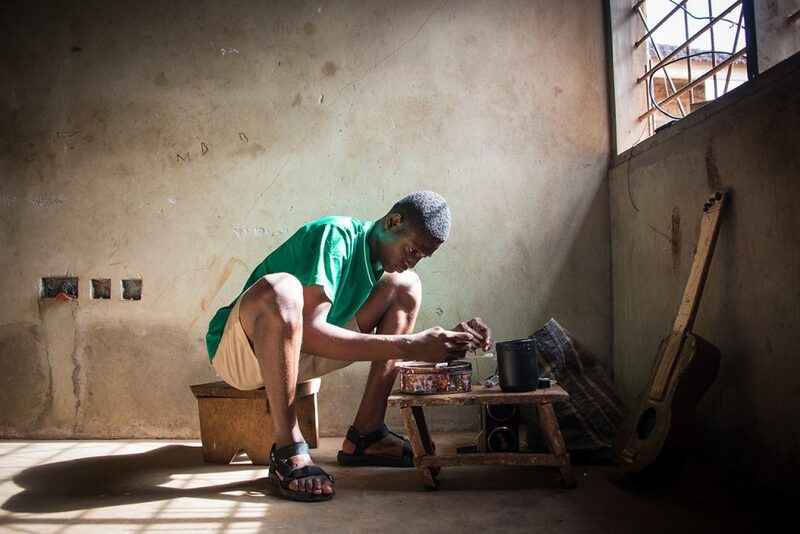 Once he has the fire crackling, his mom begins to make the porridge she’ll sell at the train station in Tema, Ghana, to passersby for breakfast. She’s already soaked and ground the millet. Now she cooks it in a large silver pot over the fire, stirring in ginger and ground chili. Curls of steam carry the scent up to the sky. Once the porridge is ready, Richard helps his mom hoist the pot onto her head and watches her silhouette disappear over the horizon. It’s now 5 a.m. and Richard grabs a yellow jug to begin his own long walk. He’ll spend the next three hours gathering water to ensure his family has enough for cooking, washing and drinking. But Richard’s thoughts are on later that day when he can finally go to the little corner workshop he’s set up at his home. His first invention, which he built when he was nine, was a lawn mower—a handheld contraption with rotating blades to help his dad cut the grass. Several years later, he built a radio using an oil jug. “What are you doing with my oil? !” Richard’s mom, Felicia, snapped as she watched him pour the perfectly good oil out of the jug. 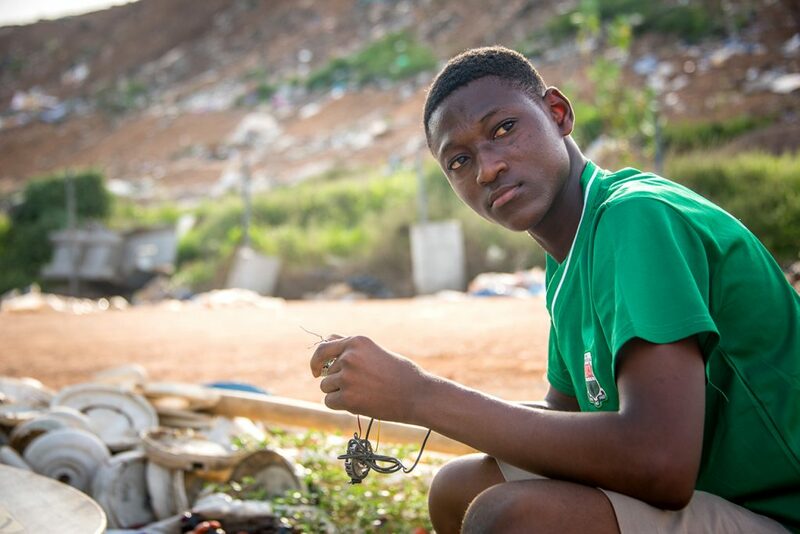 Richard had gone to a nearby garbage dump and gathered all the items he could find to help build the radio. But there were many items he still needed, so he made a list and brought it to his Compassion centre director, Steven Boafo. 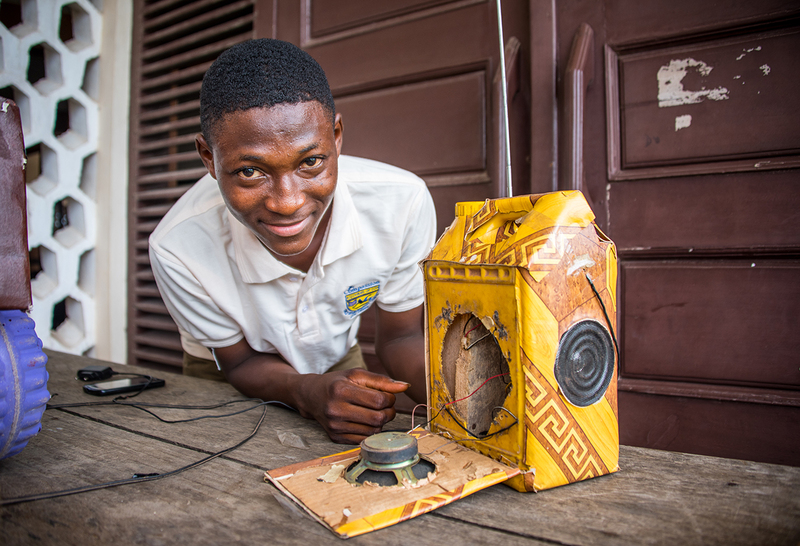 Boafo couldn’t believe Richard could build a radio on his own, with no training, but he wanted to encourage him, so he bought Richard the items he needed. Soon, Richard had built a fully functional radio, all on his own. Next, Richard built a motor for a toy ride-on car he found in the dump. The car can transport a child of up to 55 pounds, and even has a built-in MP3 player, so the little one can listen to music while cruising along. Richard continued to amaze everyone around him, building flashlights, solar-powered cell phone chargers and extension power strips from items he found in the dump. The Compassion centre workers knew they needed to foster his gift, so they arranged an apprenticeship for Richard with a local electrician who repairs broken appliances. Now Richard can earn extra money fixing nearly anything—broken radios, TVs and other electronic gadgets. 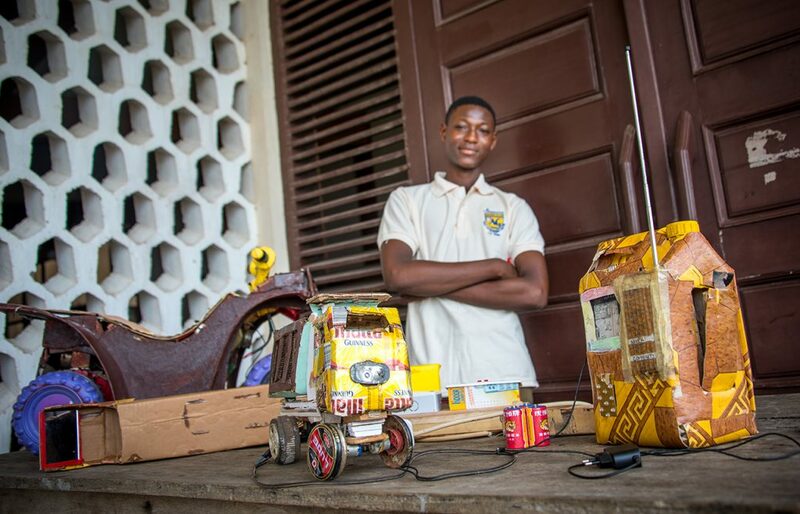 Richard hopes to go to university to study mechanical engineering and eventually design cars or planes. 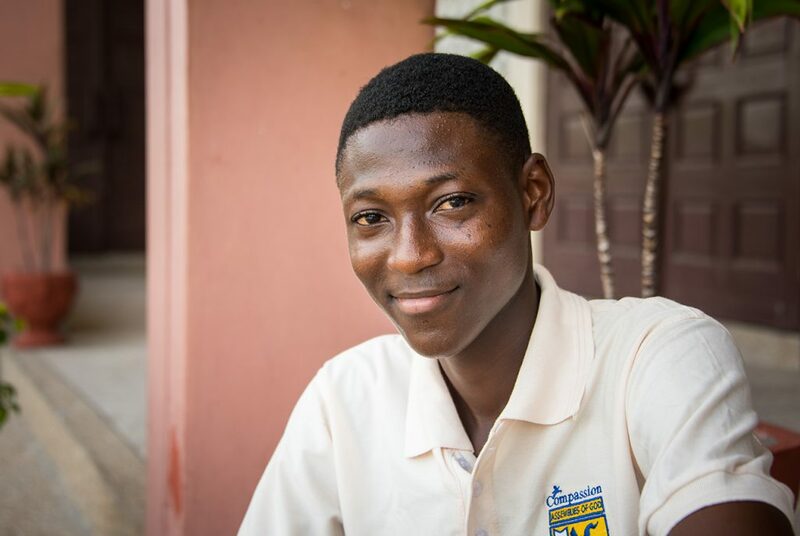 For now, Compassion is helping him attend a technical secondary school in auto mechanics. But Richard isn’t the only one at his Compassion centre with special talent. The Compassion centre workers focus on helping each young person find how God has made them unique. Your sponsorship gives children the encouragement to believe that God has given them valuable skills to offer their community. You can see it in their eyes—a spark that says they know they are valued, capable and have something to give back. That evening, back at his corner workshop—consisting of little more than a stool with trinkets and tools he’s gathered at the dump—Richard works on his next creation. Although he’s surrounded by poverty, what Richard sees is possibility.